Italian and Croatian roads have been constructed without thought about cyclists (similar to New Zealand and the UK). There are differences between Italy and Croatia though – generally Croatian roads are maintained and Italian roads are not maintained. Both Italy and Croatia control traffic speeds in designated urban areas. Croatia have ribs across the road that are noisy when you drive across them or alternatively chatter the teeth of cyclists. Italy uses the cost efficient method of potholes to slow traffic. The cost-effective Italian method would, of course, gain top marks under the New Zealand number eight wire methodology. The other difference is that Italian drivers are more used to cyclists than the drivers in Croatia. So there are normalised behavior patterns around cyclists in Italy. In Croatia drivers would either give you a very wide berth, or they would hoot at you and try to nick you with their side mirrors. So it is no surprise that everybody in Croatia tells you how wonderful the road ahead will be for cyclists. Of course the Croatian roads have good views and the road surfaces are well maintained. The trouble is the roads are designed for at most two trucks traveling in opposing directions. Always when there are two cars on the road with us, the car behind us pushes between us and the oncoming driver, forcing the oncoming driver to the edge of his side of the road. So if there is one or more trucks involved it becomes Russian roulette on who is doing what. Cyclists are forced on these roads for large sections along the Croatian coast road. So don’t take any cycling tips from the Croatian public. So we have decided to do some island hopping to avoid these roads. It will slow our progress a bit, some days will have less cycling, but it may be more interesting. We have decided to enter Pag via Zadar, ferrying off Pag onto the road of death for a couple of hours, then using the ferryman for passage onto Rab, from where we obtain passage to Krk. The above paragraph is a short extraction from the the Star Wars prequel. Cyclists need to rinse or wash their clothes every night and always look at how an accommodation can be used to wash and dry clothes (washbasin, plug, hangers). You can hang your wet stuff in the shower or in various other spots (we have been forced to hang them on the bicycles). Things balance out. When it is hot, the breeze from the front will help to keep you cooler. When it rains the heat your body creates from the exercise will warm you up. You inevitably develop sore spots. Some of these may be a sore wrist, sore aching muscles and saddle sores. On the flip-side your body also adapts and become more effective each day. Food tastes better when your body really needs it. Many cyclists drink beer. Beer provides carbohydrates and alcohol and liquid. Beer is a triple whammy that makes your body purr after you have done a days cycling. You need fewer belongings and simple stuff become more valuable, like rope and tape. You depend on your bicycle, so the state of your bicycle becomes important. This is common to all cyclists, so it is very normal for inn-keepers to initiate the first interaction by saying they have a place where you can lock your bicycle. Conversely it is reassuring that you can replace your whole bike for a few hundred dollars if you need to (for the cost of renting a car for a week or two). It seems like the hotel community is keen on cyclists. Cyclists leave early and they drink a lot of beer. They will also eat almost any food after a ride. You become adaptable. If you travel by bicycle and you are finding your own way and accommodation, days can be a little chaotic at times. Random things happen. A kid in a very small village threw stones at us. We used water bottles to store left-over red wine. A sip of wine is useful to improve the mood when you a close to your destination but you are struggling. Bicycles and equipment break. The towns where you planned to stay may not have suitable accommodation. The people you stay at or road users may behave in an unexpected manner. Your main source of locomotion is your body, which may have an injury or feel off. Some days you will get lost while you are trying to find accommodation. You learn that life is not on rails. Your stable job and the next five years of your planned life is a chimera. 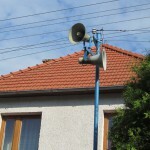 There is the strange phenomenon of speakers that are mounted on telephone an power poles in Slovakian towns and cities. When I first saw and heard them it reminded me of as fantasy game I once played (a game called Twinsen). We saw a women with her baby in a pram standing still under a telephone pole listening to a broadcast. Some sources say the Soviets used them as a propaganda tool. A tourist information agent said they are used for sports and weather warnings. Can this broadcasting network be broadcasting on hidden frequencies? 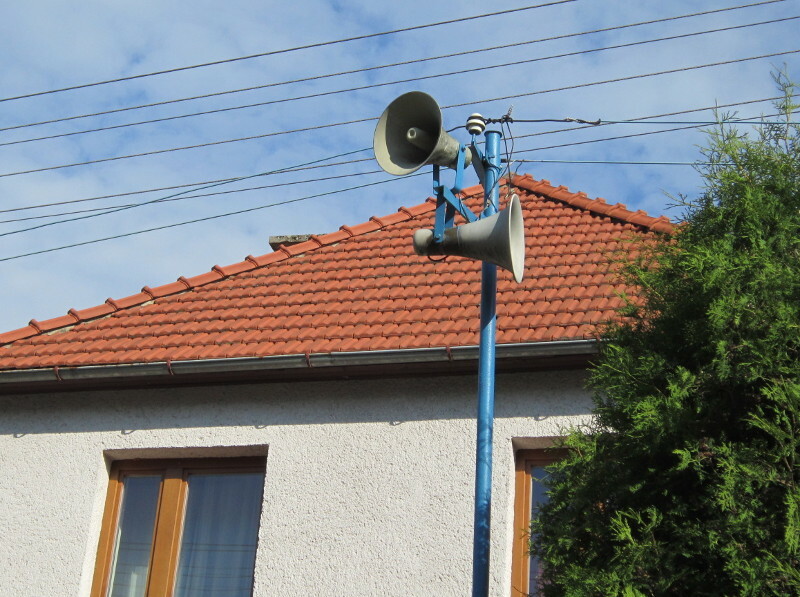 Do the soviets still have back-door access to the Slovak broadcasting network? We are getting earplugs so we can monitor the behaviour of people around us during the broadcasts.